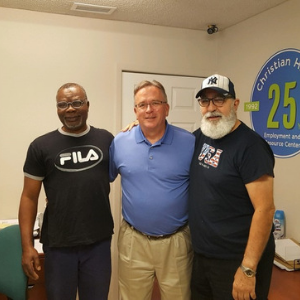 Two years ago, two men from opposite sides of the globe, one from the Caribbean and one from Africa, showed up at Christian HELP seeking similar help. Both are over sixty, American citizens, hoping to not rely on government subsidies and only wanting to sustain and support themselves and their families. Little did they know that their paths would cross, their lives forever changed, and that they would become Christian brothers. 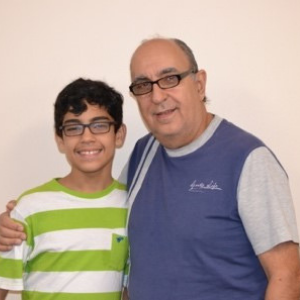 Raul a retired accountant originally from Puerto Rico, but most recently living in Venezuela with his wife and son, came to Christian HELP in July 2016 with a few simple goals – find part-time employment to supplement his SSI and to save enough money to bring his family to the United States. This was a huge unknown risk for Raul. For six months Raul and his Care Manager Jeff journeyed together, updating his resume, discussing online job search tactics, practicing interviewing, and praying together. Raul had many peaks and valleys, tears and exhortations but in January 2017, Raul was offered a part-time job with local employer as a stock clerk and cashier. By the next month, he had earned enough money to fly his son here. Three months later, he was able to bring his wife here. In June 2017, Raul became a permanent employee. He continues to work for this employer today. While working at the same employer, Raul met a fellow Christian from Africa who had an accomplished career as a civil servant for the state of Florida, but had fallen on difficult times. He was laid off. James was facing homelessness, hunger and depression. James had a part-time job, but they reduced his hours significantly resulting in homelessness. He was now living in his car. His new friend at work, Raul, recommended that he go to Christian HELP for support and assistance in finding a sustainable job. James came to Christian HELP in February 2018. His resume and his job search skills were outdated - since he had been gainfully employed for over 15 years - and his interviewing skills were lacking. With the help of Jeff, his resume was updated which was the first priority. James was humble and implemented all of the suggestions we made. It worked. Instead of searching for a job at a different employer, we encouraged him to apply for better positions, both in terms of pay and hours, at his current employer. It worked. He is now employed full-time with benefits. He also recently applied for his state retirement benefits. He is now renting a bedroom, has his own bathroom and shares a kitchen. He is hoping to one day have his own apartment. If you could only see the smile on his face today. Today, Raul and James are close Christian brothers and their families hangout together. And Recently, they came into Christian HELP to pray, to give thanks and share their love and appreciation with anyone and everyone who would hear.